Combine pear halves and dessert wine in a heavy saucepan. Add vanilla. Bring to a boil. Reduce heat, cover and simmer until pears are just tender. With a slotted spoon, transfer pear halves to paper towels and drain. Boil pear liquid in saucepan until reduced to 2 Tbsps. Remove from heat and set aside. Finely grind 1/2 cup pistachios and sugar in food processor. Add butter and egg. Blend until filling is combined. Unfold pastry sheets on work surface. Using 4 1/2 round cookie cutter, cut out four rounds from each sheet. Using 3 1/2 round cookie cutter, cut out one 3 1/2 round from each of four rounds. Brush egg glaze over outer edges of four 4 1/4" solid rounds. Pierce rounds all over with a fork. Top each one with a pastry ring. Transfer to baking sheet. Freeze for a half hour. Preheat oven to 375°F. Bake pastries 10 minutes, piercing centers with fork if centers rise. Remove from oven. Reduce oven to 350°F. Spoon 1/4 of filling into center of each pastry. Slice pear halves and arrange atop filling, covering completely. 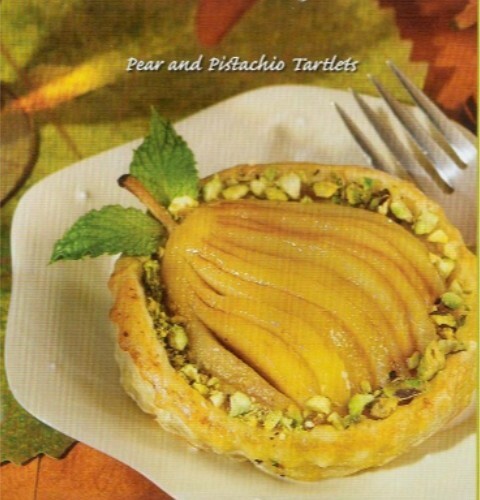 Sprinkle chopped pistachios around pears and bake until golden brown, about 20 minutes. Cool pastries. Brush pears with glaze and serve.